Open innovation requires skills to manage various processes of knowledge development, such as the ability to acquire knowledge, its commercialization, development and protection of intellectual property, shaping the relationship between the company and its surroundings. Many companies declare openness to innovations, at the same time the organizational structure, existing procedures, management culture, incentive systems are not ready to seek and transfer knowledge. The biggest challenge for managers is to carry out a transformation process from closed organization to an origination that is open to innovation. The article analyses the possibility of building an organizational and legal structure with the so-called ‘permeable borders’, open to innovation. 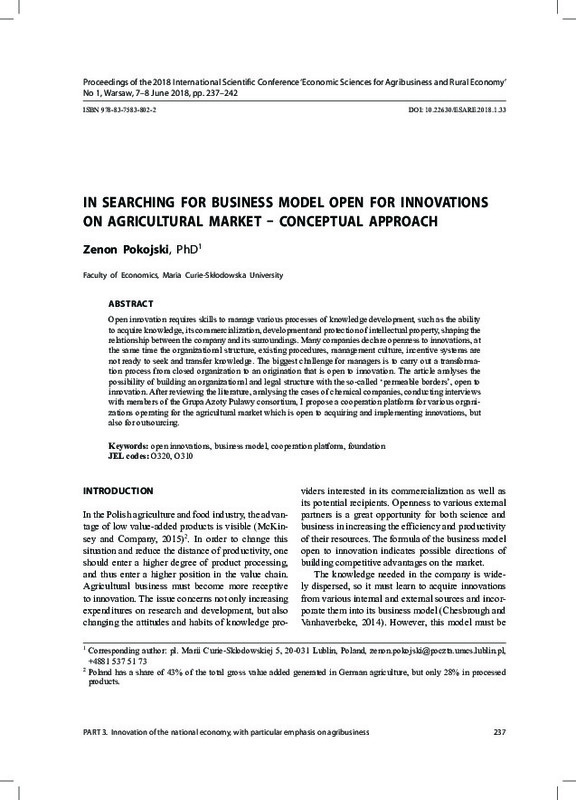 After reviewing the literature, analysing the cases of chemical companies, conducting interviews with members of the Grupa Azoty Puławy consortium, I propose a cooperation platform for various organizations operating for the agricultural market which is open to acquiring and implementing innovations, but also for outsourcing.